Sweetgreen, every millennial's favorite salad spot, isn't trending for naught. Its innovative and toothsome concoctions, with their perfectly balanced textures, flavors, and ingredients, unequivocally warrant its cult-like following. Case in point: I am a fervent Spicy Sabzi and Curry Chickpea girl, admittedly taking utter delight in the latter's newest seasonal variation, the Curry Cauliflower Bowl. Delight, that in an odd turn of events, quickly turned competitive. Sweetgreen discloses the ingredients of every single one of its salads on the internet, down to the ubiquitous "umami seasoning" you'll find sprinkling most proteins. After reading the list, I was convinced I could make the bowl in my own kitchen. But would it be as good? The challenge was on, Sweetgreen vs Rachel: a Curry Cauliflower Bowl hack. I'm thrilled to report that the hack was an overwhelming success. 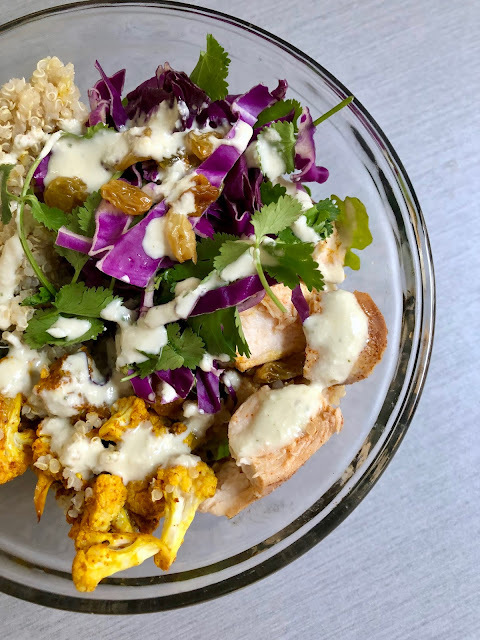 The salad was delicious, and I've been smugly toting my Tupperware of Curry Cauliflower to work each day, passing my local Sweetgreen and picturing the line that will be snaking out the door in just three hours time. Was it a lot of work? Yes, and at points I wished someone was eagerly mixing the salad for me as I painstakingly assembled my homemade bowl. 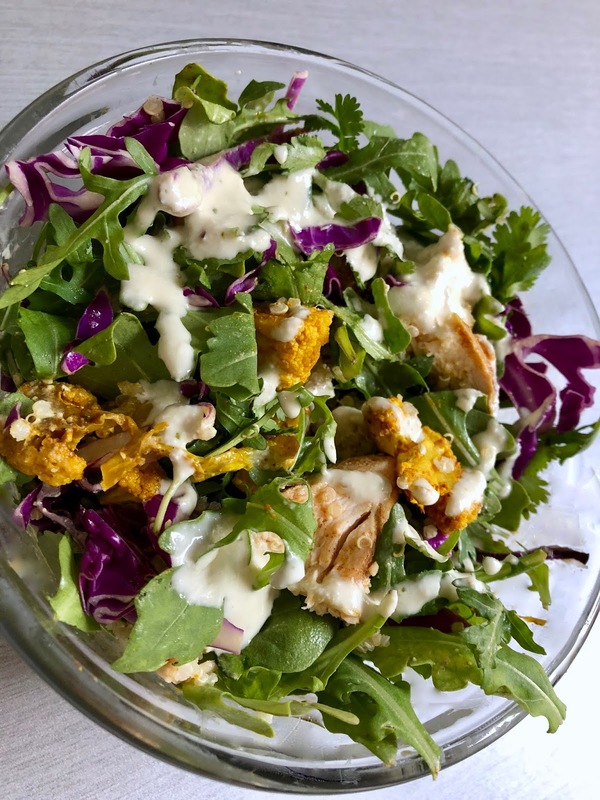 But at the end of the day—when I didn't have to mine through greenery to get to the salad's jewels, and large chunks of chicken and cauliflower were overly abundant, because, well, I wanted them to be—the extra effort was worth it. 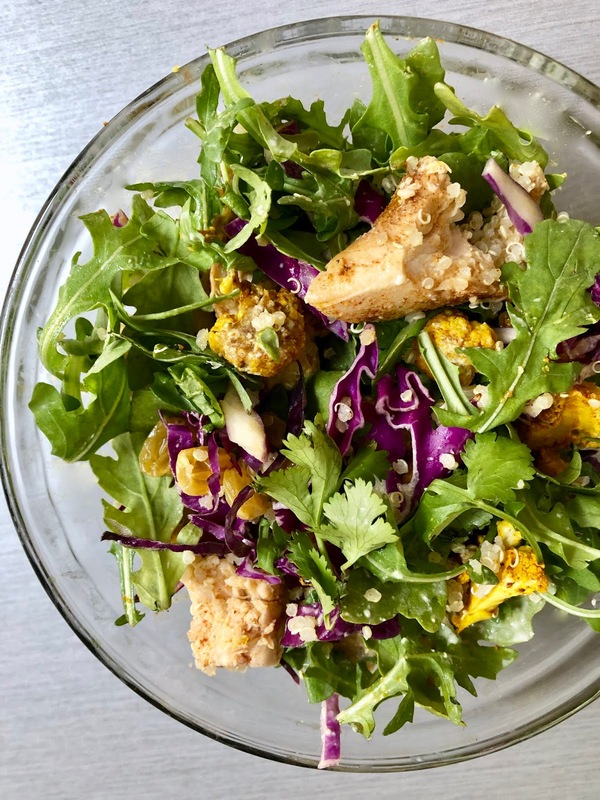 Full disclaimer, Sweetgreen lovers: the list of ingredients for each topping and dressing is exhaustive, but not quantified, so I had to do a lot of tasting and seasoning as I went; a lot of "handful if this, pinch of that". I was able to find the cauliflower recipe on the Sweetgreen blog, but only used about half the ingredients listed in the cucumber tahini yogurt dressing. It was still fantastic, and definitely the type of dressing that's worth keeping on hand in the fridge. A thin version works nicely as a dressing, but made a little thicker, it becomes more Tzatziki-like, and can serve as a marinade to poultry or pita and raw veggie dip. 1. Make the cauliflower. Preheat oven to 425 degrees. Combine florets, curry powder, 2 Tbsp olive oil, and ½ tsp salt in a large bowl. Spread on a baking sheet, and roast for 25-30 minutes. 2. Make the chicken. In a small bowl, make the "umami seasoning", combining garlic powder, onion powder, chili powder, nutritional yeast, and ½ tsp salt. Pound chicken breasts until they are of uniform thickness, then toss chicken with seasoning and 2 Tbsp olive oil. Bake, along with cauliflower, for 15 minutes. After removing from oven, cover chicken with tin foil and let sit for 10 minutes. Slice through, and if chicken is still pink, cook for 5 more minutes. 3. Make the dressing. Combine cucumber, yogurt, tahini, lemon juice, garlic, 2 Tbsp cilantro, 2 Tbsp olive oil, and generous shake of salt and pepper in a blender. Pulse, taste, repeat. If dressing is too thick, add in water, 1 Tbsp at a time. 4. Assemble the salads. 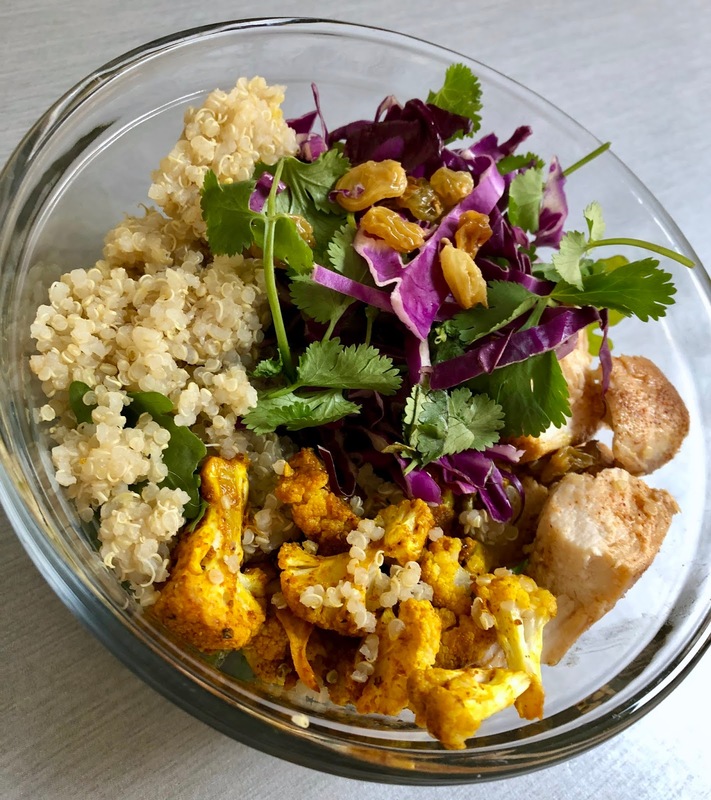 Layer 2 large handfuls of arugula, ½ cup warm quinoa, ~¼ cup diced chicken, ¼ cup cauliflower, ¼ cup cabbage, 2 Tbsp raisins, and 2 Tbsp of cilantro leaves in each bowl. Drizzle with 3 Tbsp dressing. Toss, and season with salt, pepper, or more dressing if needed.